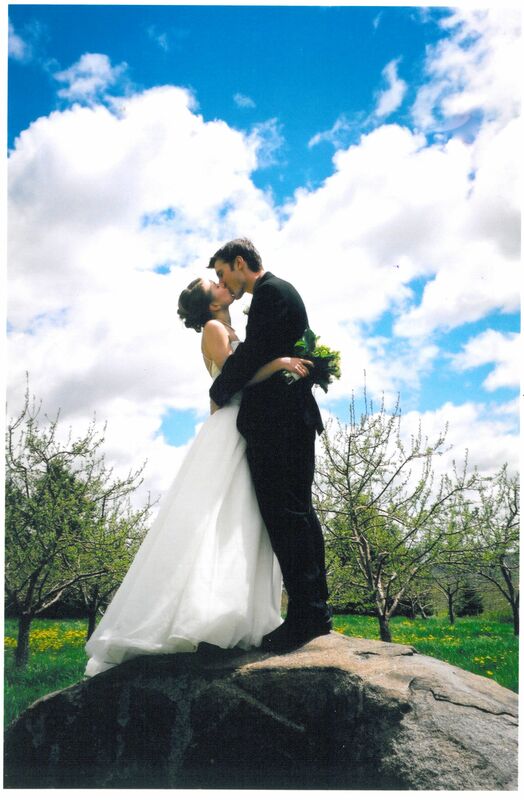 Danny and I were married in an apple orchard in rural Quebec exactly ten years ago today. It was a late spring that year; the apple trees shimmered in green, but withheld their blossoms for warmer days. Although the sun shone, it was a cool day, but we only felt the warmth of our young love and the thrill of the moment we had been anticipating for years. My dad walked me down the freshly-mown aisle of thick spring grass, while my sister-in-law, Laura, played Vivaldi’s ‘Spring’ in a violin solo. Before family and friends, in a simple ceremony, we were wed.
Today we will return to the very same orchard with our three little ones in tow, to picnic on the grass, play tag among the trees, and reminisce over our wedding day. Later tonight, Danny and I will slip away for a dinner on the town where we will sip champagne, slurp oysters, and forget for a few hours that we are responsible adults with a family, car payments, mortgage and the like. It was a long-time dream of mine to marry Danny in an orchard. On one glorious day, ten years ago, my dream came true. On that day, four of my chef-girlfriends pooled their hard-earned money and gave me a 5-Qt tilt head KitchenAid stand mixer in a beautiful cherry red. It was my absolute favorite wedding gift – and my most prized possession in the kitchen for years. Over the last ten years I have put that little mixer through the paces. It kneaded the bread I baked for my new husband, it mixed the peanut butter cookies for my pregnancy cravings, and it beat the batter for my children’s many birthday cakes. That KitchenAid mixer has been my rock. That, my friends, is the KitchenAid 7 Qt Bowl Lift Commercial Stand Mixer. Isn’t she marvelous? KitchenAid USA was awesome enough to send me this mixer to review (and giveaway!) and it has not disappointed. I get the impression that the 1.3HP motor I am now working with is easily going to last me another ten years of marriage – and ten more after that. Strong and sturdy, this mixer has everything going for it. Not only is it the most powerful model to date, but it is also the most quiet – a feature I can appreciate when Clara is dozing in her swing in the kitchen while I am baking. My favorite feature? That generous 7-quart bowl of polished stainless steel! 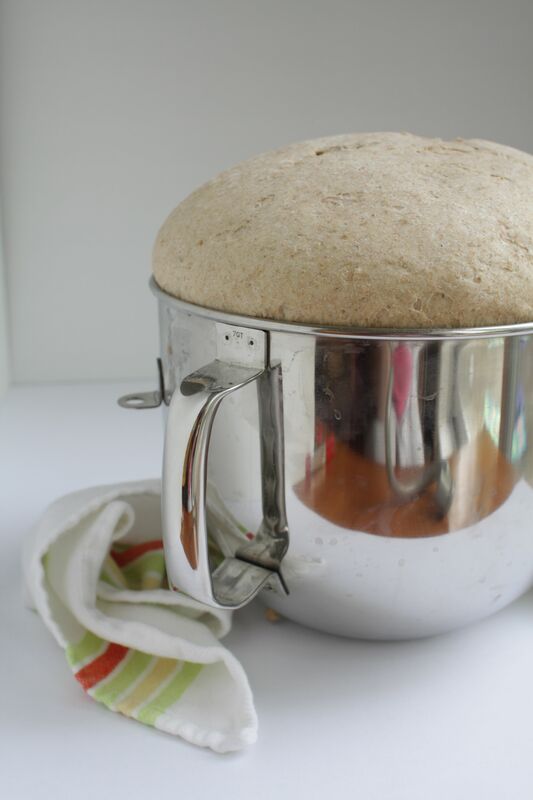 It can take on a double batch of whole-wheat bread, rising included, as pictured below. It handles smaller jobs equally well. Included with the KitchenAid 7 Qt Bowl Lift Stand Mixer are the 11-wire Elliptical Whip, coated metal Flat Beater, Power Knead Dough Hook, and a Pouring Shield. Guess what? All the accessories are dishwasher safe, ideal for me, as the baby is usually just waking when it comes time for kitchen clean-up. Aside from those attachments, you can also accessorize your KitchenAid mixer with super fun – super practical – accessories such as the Ice Cream Maker or the Food Grinder. Think of the fun you could have with those! 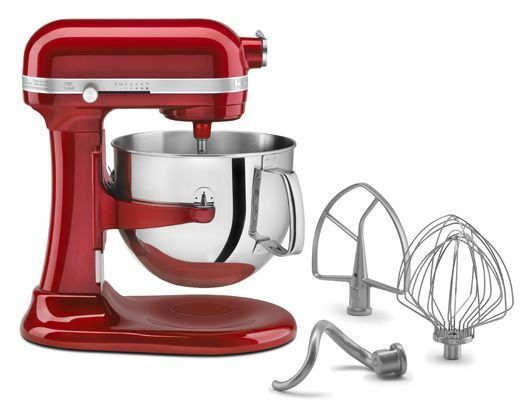 7-Qt Stand Mixer Giveaway from KitchenAid! So, today we celebrate the occasion – with each other, with our children, and with you! In honor of our 10-year wedding anniversary, I’ve partnered with Kitchen Aid USA to bring you an amazing giveaway. 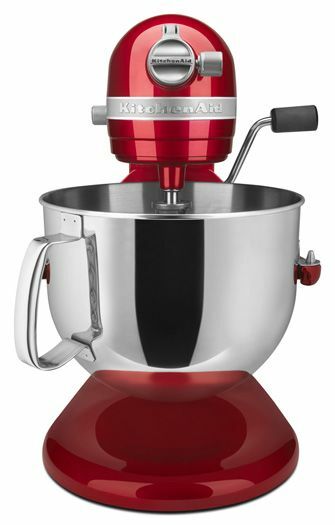 One Simple Bites reader will win a 7-Quart Bowl-Lift Residential Stand Mixer from KitchenAid with an estimated retail value of $899! You can even pick your choice of colors—candy apple red, medallion silver, black storm, or white. Everyone has three chances to win. Here’s how: GIVEAWAY ENDED. Fine Print: This giveaway is open to US residents only, provided for you by Kitchen Aid USA. Disclaimer: Kitchen Aid provided me with a stand mixer to review. I was not compensated for this post. All opinions about Kitchen Aid are my own, formed in my experiences with their product. This giveaway will end Tuesday, May 22, at 11:59 PM. Winner will be announced on this post on Wednesday, May 23. Good luck to all! I like Simple Bites and KitchenAid on FB! My favorite thing to bake is definitely bread. So warm, inviting, and makes wonderful gifts! My favorite thing to bake is definitely pie! I love baking chocolate chip cookies from a Cook’s Illustrated Recipe. I bake dark chocolate chip dried cherry oatmeal cookies in such big batches I have to mix them with my bare hands. This mixer would definitely do the job for me. Already liked kitchenaid on Facebook…don’t tweet. 🙂 Happy Anniversary! I love cooking pretzel bread. Favorite would have to be peanut butter cookies. I love to bake cinnamon rolls, & cupcakes. I love to bake fresh bread! I liked simple bites & kitchen aid on Facebook. My favorite thing to bake is rhubarb anything! Last night I made rhubarb streusel muffins. Rhubarb reminds me of my grandmother, because she used to have a large plant in her vegetable garden, now we have three! My favorite thing to bake is red velvet cupcakes! I liked both companies on Facebook! Thanks! I just liked simple bites and kitchen aid on facebook. I also tweeted my followers about this giveaway. I love baking hearty sandwich bread! My favorite thing to bake is apple cake!! Makes the whole house smell delicious!!!! You’ve been added to my “likes” as well as kitchen aide! I have been baking sweet breads lately. Family will have as part of breakfast and daughter likes a slice for afternoon snack. Win, win. I follow both of you on twitter and tweeted about the giveaway. I bet the orchard was beautiful get married in, with spring and the greenery lush. I like both Simple Bites and KitchenAid on Facebook. That photo of you two with the sky in the background is just about the most beautiful thing I’ve ever seen! 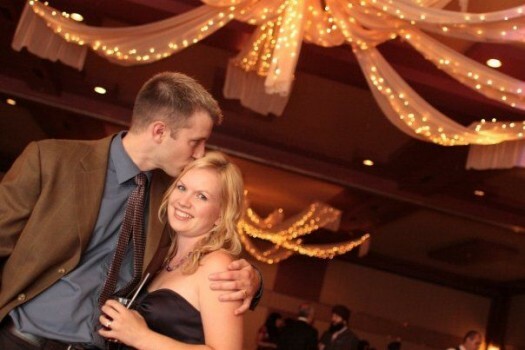 What a storybook marriage! congrats to you on your anniversary. My favorite thing to bake: cookies! I love to bake cookies and bread with my kids! I liked both KitchenAid and Simple Bites on Facebook. Chocolate chip cookies…they make everyone in the house come runnin,! I love to bake pound cake! I would love to start baking my own sourdough bread, that’s my favorite! My favorite thing to bake is red velvet cake! I just love the look on my families face when they eat their favorite southern dessert! I make the best chocolate chip cookies ever! A good stand mixer is such an indispensable tool for baking. Ahhh, Kitchen Aid mixers. I love baking a good old fashioned chocolate chip oatmeal cookie. The same kind my mom uses her 38 year old Kitchen Aid mixer to make. Her’s is a trendy avocado green. So many of these words could have been my own. In June we will celebrate our 10th anniversary, and the only gift I really wanted was a Cobalt Blue Kitchen Aid. We used gift cards from our wedding to buy it and when I brought it home I called my Mom and proclaimed,”Mom! I’m finally a real woman. (to which there was an awkward silence and in the moment I didn’t really understand why until I realized that we had only been married a few short weeks and this statement could really be taken the wrong way…oops) I finally have my own Kitchen Aid mixer!” She laughed, and celebrated with me. All the women in my family had one and in my mind, you weren’t a real woman until you had one yourself. I too have been feeling ready for a new one. “She” has provided much help and joy in my kitchen but I do think she’s getting to be a bit to small. Seven quarts sounds heavenly. As does something a bit quieter. oh! and my favorite thing to bake is German Chocolate cake. So delightful.